The carpenters' union and International Union of Operating Engineers Local 49, both of which endorsed Hillary Clinton, will support the first-term congressman in the midterm elections in his rematch against former health care executive Angie Craig. Labor leaders praised Lewis's record in Congress, highlighting his support for domestic energy development as well as his willingness to buck his political party. Lewis has supported Davis-Bacon, which favors union wage levels in federal projects despite the push in the conservative movement to abolish wage mandates. "In Jason's time in Congress he has cast repeated votes in support of Davis-Bacon prevailing wage and has led on the issue of changing school curriculum to encourage more people to look at careers in the construction industry," carpenters' spokesman Adam Duininck said in a release. Both unions also praised Lewis for focusing on local issues and maintaining a relationship with labor leaders. Local 49 business manager Jason George said that Lewis and the union were not in lockstep on every political issue, but the congressman had supported the issues that help support the building trades and traditional blue-collar workers. 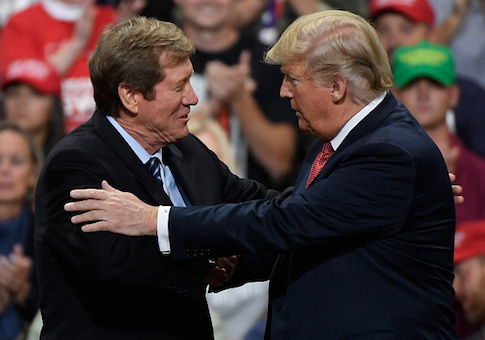 "Jason Lewis has made an effort to get to know our Union, understand our issues, and has taken politically tough stances in support of good paying Union jobs," George said in a statement. "We don't always agree on every issue, but we know that when it comes to supporting our jobs, he has stood with us, and that is why we are standing with him." Lewis has made the development of the Enbridge Pipeline, which is projected to attract hundreds of millions of dollars in investment and create thousands of jobs, a centerpiece of his campaign. He has criticized environmentalist Democrats for holding up domestic energy projects and said Craig would side with her party over her constituents. Craig announced in August that she would support the pipeline if she is elected, though Lewis continues to criticize her campaign's ties to environmentalist groups. "I'm working hard to make certain we get Enbridge so we get the Pine Bend refinery in the second district … the oil it needs to grow the economy," Lewis said in the Oct. 21 debate. "My opponent says, ‘well Sierra Club won't let me endorse that.'" Lewis pledged to continue advocating for local laborers in Congress. He said he will continue to focus on workforce training and revamping the apprenticeship system, one of the Trump administration's priorities, "so labor groups are able to thrive with adequately trained laborers." "This nation was built on the backs of hardworking Minnesotans like those belonging to these two groups and it is important we support them with our policies in Washington," he said in a statement. "I am proud to have supported them in my first-term in Congress and look forward to continuing to work on their behalf." The Craig campaign did not respond to request for comment. Lewis narrowly defeated Craig 47-45 percent in 2016, the same margin of victory Trump earned against Democratic nominee Hillary Clinton, despite the fact that he trailed in the polls. Voter surveys once again show Craig a favorite to defeat the Republican, holding a double-digit lead in an October New York Times poll. The Lewis campaign has released its own internal polling showing him with a 3-point lead. The Cook Political Report rates the race as "Leans Democratic" as it enters the closing weeks of the campaign. This entry was posted in Politics and tagged Big Labor, Minnesota, Unions. Bookmark the permalink.